Systemic contact dermatitis (SCD) traditionally refers to a skin condition where an individual who is cutaneously sensitized to an allergen will subsequently react to that same allergen or a cross reacting allergen via a different route. It occurs to allergens including metals, medications, and foods. The exact pathophysiology underlying this disease remains unknown, although it appears to be mediated by type 4 hypersensitivity reactions and possibly type 3 hypersensitivity reactions. The p-I concept (pharmacologic interaction with immunoreceptors) hypothesized that drugs are able to bind directly to a T cell receptor without first being presented by MHC (major histocompatibility complex) molecules and without prior metabolism, which would help explain why SCD can be seen on first exposure to medications. Nomenclature remains a challenge as SCD can be subcategorized using terms such as ACDS (allergic contact dermatitis syndrome) and its four clinical stages, Baboon syndrome, and SDRIFE (symmetrical drug-related intertriginous and flexural exanthema), which share many overlapping features. 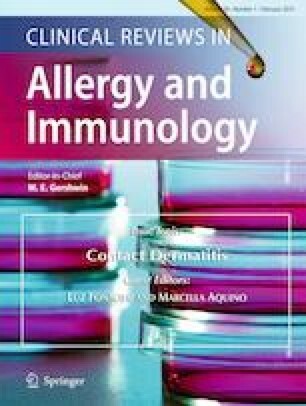 Food allergens may be responsible for uncontrolled or persistent symptoms in patients with contact dermatitis who do not respond to topical avoidance. With medications, symptoms may be induced by topical application versus systemic administration. Patch testing (PT) may be beneficial in diagnosing SCD caused by metals and many topical medications including corticosteroids, antimicrobials (ampicillin, bacitracin, erythromycin, neomycin, nystatin), NSAIDs (diclofenac, ibuprofen), anesthetics, and antihistamines (chlorphenamine, piperazine). Current treatment options include topical steroids and oral antihistamines for symptom relief and dietary avoidance to causative foods or metals. Dr. Marcella Aquino is immediate past president and a board member of the Long Island Allergy & Asthma Society; she has served as principal investigator on asthma clinical trials for Merck & Co. (SPIRO) and F. Hoffmann-La Roche (Study 1159871); has served as a sub-investigator on clinical trials for Novartis, Genentech, Shire, and Regeneron; has been paid for giving lectures by the ACAAI and WAO; has had travel expenses covered/reimbursed for travel to meetings by the ACAAI and WAO. Dr. Gregory Rosner declares that he has no conflict of interest.